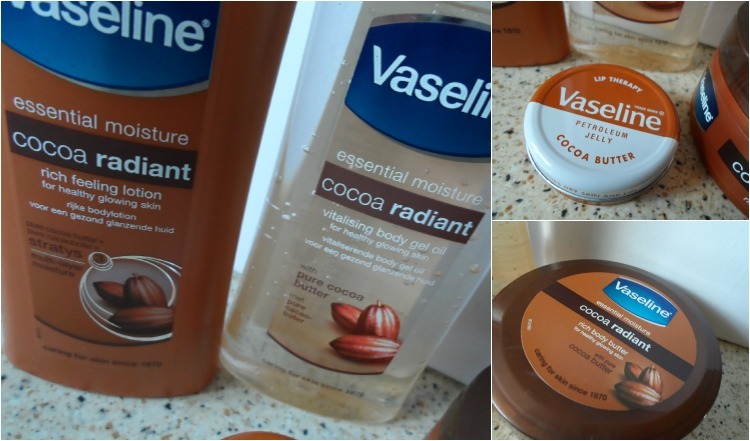 Sophsterlicious • UK Blog: Vaseline Cocoa Butter Range. So the British weather has been terrible recently and terrible weather means dry skin – Yuk! Recently my saviour has been some products I’ve been using from the Vaseline Cocoa Butter Range. I’ve used the original Vaseline petroleum jelly for years on my lashes, brows and lips to keep them hydrated. In recent years they’ve come out with different flavour Vaseline lip therapy tins, and loads of other things, like this range to look after your body – they also have products for men and deodorants.. Anyway, I have been loving the Cocoa Butter range, it smells absolutely divine and is so hydrating! It contains lovely Brazilian nut and Almond oil. They are all very reasonably priced too, which is always a bonus! The Lip Therapy is cutely packaged in the mini tin and is a lovely lip balm. I always have one of these tins with me always, one is by my bed, one on my desk – I just love it. The best thing about these is that they’re only £1.99! The Cocoa butter is such a yummy taste and scent and makes a change from the plain one. The Gel Body Oil is one of the standout products for me. I love the smooth feeling of this oil, this doesn’t feel greasy at all and I love to use this straight after a shower, I massage it into damp skin and it soaks in super fast and leaves my skin feeling and looking so radiant. This is £4.69. The Smoothing Body Butter is so rich and thick; it is so smoothing and sinks in nicely without any sticky residue. This is £4.69 for a huge tub, and it lives up to any other body butter I’ve used, and is half of the price. I keep catching my boyfriend using this after a bath – sneaky! Last but not least, The Radiant Rich Lotion. This is a nice consistency and a little really goes a long way, it leaves my body feeling hydrated and my skin has a nice glow after using this. I really like to use lotions because I find they’re quicker and easier to use. This lotion is such a bargain at just £2.93 for 200ml. I’d highly recommend it. The best thing is really luxuriating and using a couple of the body products together, the skin feels so smooth and plump and just has a nice healthy glow about it. These have kept me free of dry flaky skin in the colder months… and when summer finally arrives (I hope!) they will be my go to products for then too. If you want to smell delicious, look radiant and feel hydrated, this bargain priced range is one to try! Love everything coco butter! Couldn't live without it! Great Blog!